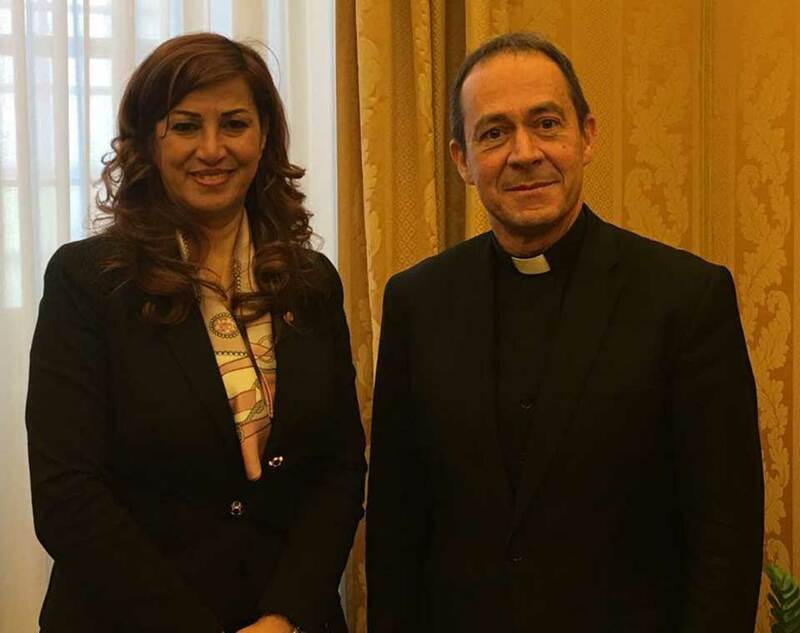 Today, Mrs. Kader met with the Undersecretary for Relations with States of the Vatican State Secretariat, Mgr. Camilleri, accompanied by Mgr. Yonut Strejac. At the center of the talks, a reflection on the recent passing of former Iraqi President Jalal Talabani and the delicate situation in the Kurdistan Region, following the referendum on independence. Although the referendum was conducted in the utmost transparency and serenity, and despite the fact that the goal was not to proclaim independence, but to engage in a constructive dialogue with Baghdad, the reaction of the central government and neighboring countries has been very tough. Huge sanctions were imposed, from closing the airspace to the mobilization of the armed forces at the Kurdish borders, to the threat of closing oil pipelines towards Turkey in order to kneel a country and a people. Mrs. Kader invited the Holy See and the Holy Father to intervene in favor of the reopening of a dialogue with Baghdad and neighboring countries in order to make them clear that the will of a people cannot be ignored or cancelled and that the expression of popular will through the instrument of the referendum is a legitimate act envisaged by the constitution that cannot determine such consequences. Mgr. Camilleri will pass this message to his superiors, believing that the Holy See will do as much as possible to bring the parties closer for the benefit of the whole area.